From the “Stories of our Dearly Departed” series from Kelly Grimaldi, Historian and Director of Education and Program Development for Albany Diocesan Cemeteries. In January, Albany Diocesan Cemeteries launched “Stories of our Dearly Departed” a series featuring stories and photographs of those who are buried within our 18 upstate NY cemeteries. These stories will be featured from time to time on our Blog, Facebook page and in our monthly newsletters. The first stories were researched and written by our Historian Kelly Grimaldi, but we are also asking the community to contact us if they have a story about a loved one buried in one of our cemeteries that they would like to share, or if they would like Kelly’s assistance in researching someone for a “Stories” feature. Our hope is that people will enjoy reading about the lives of our community members just as much as we enjoy learning about them from the families we serve and in the information we find throughout our archives. There are so many fascinating stories buried within these Sacred Grounds! Luigi Prediletto was left on the door-step of a convent in Sicily. It was not uncommon for poor, unwed mothers to abandon their babies in that manner in the 19th century. The children were called Foundlings and the nuns gave them names and cared for them the best they could until they were old enough to make their way in the world. When Luigi the orphan boy grew up he found work as a mason and for ten years he dedicated his days to making money. One day he laid eyes on a pretty 17 year old girl and fell in love. He married Concetta Cardillo, a native of Palermo nine years his junior. Two years and two babies later, Luigi made his way to America to find a better life for his young family. It took five years of hard work before he managed to bring his wife and children to Troy, New York where he became known as one of the best masons in town. 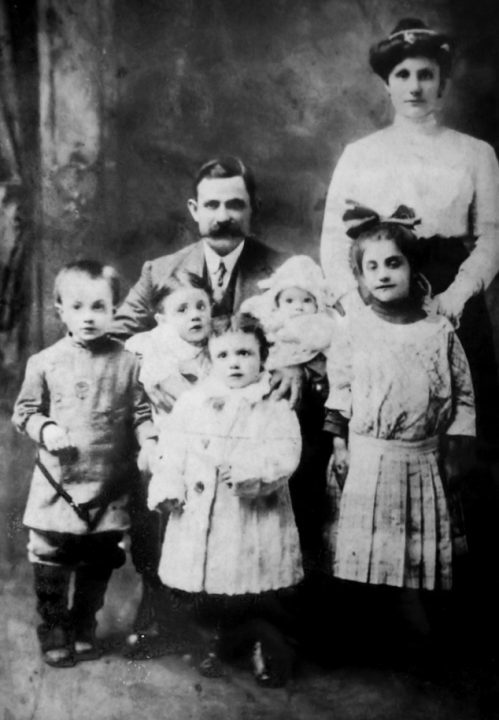 They lived modestly in a small house in Troy and grew their family to nine children. Then tragedy struck. Concetta (Cardillo) Prediletto was a dark haired beauty with expressive brown eye and pale skin. She descends from the royal Doria Family but because her grandmother, the daughter of a duke, married a blacksmith and was shunned by the family, Concetta would never know life as an aristocrat. Instead she found herself a housewife in a new country pregnant with her tenth child at the age of 32. Little Jeacomina (Jennie) was born premature on October 23, 1918 and died two days later. Concetta lay in bed suffering from the heart break of losing her baby but what was worse – she had the dreaded Spanish Flu and like millions of victims before her, she died only two days after baby Jennie. Luigi was devastated. The family unit was virtually destroyed the second Concetta took her last breath. What would become of the children? Thirteen year old Josephine and Nicholas, her 12 year old brother had to assume the role of adults immediately and care for the younger kids and the house while their father went to work everyday. There was no safety net; no paid family leave; no welfare and no choice but to make it on their own. Imagine how hard that must have been. The youngest children were sent to an orphanage when it became clear to Luigi that his 13 year old could not handle to immense job of mothering seven kids ages eight to one, buy groceries, cook for the entire family, clean the house and wash the clothes by hand. By comparison 12 year old Nicholas had it easy – he entered the workforce full-time to help his father pay for boarding his youngest brother and sisters at St. Colemans Orphan Asylum in Watervliet, NY. This is the third posts of our “Stories of our Dearly Departed series that will be highlighted from time to time on Albany Diocesan Cemeteries’ Blog, Facebook page and in our newsletters. We hope you enjoy the stories and research brought to light on those who are buried within our 18 cemeteries. Do you have a story of an ancestor and/or loved one buried in one of our cemeteries that would be interesting to highlight? If you have a story for us, contact Kelly at 518-350-7679 or [email protected]. What a beautiful story of family love passed down through generations…and that in spite of overwhelming grief. Thank you so much for sharing this tender story of your family history. Awesome story Kelly! It makes sense that you come from a remarkable family – I’m believing you are royalty! I love this idea. I am going to send a story on someone at St. Agnes in Menands. I love this idea. I have one I will send about someone in St Agnes Menands. Wonderful, we will look forward to reading it! I love these stories, Kelly, and this one was particularly heartfelt. Thank you for sharing your grandmother’s story. I hope you are able to learn more about her background!